Drive a tank through an orphanage. There are few things as terrifying as a polygonal nightmare that you can only escape by controlling a frail, human-shaped tank. Capcom is remaking the classics with flashy graphics and modern control schemes, and who knows what's happened to Silent Hill, but some are still carrying the torch for the old methods of scaring the crap out of people. 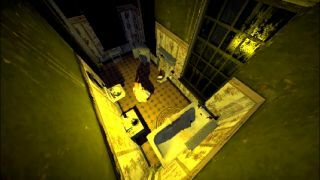 The Glass Staircase is an homage to PS2 survival horror like Haunting Grounds and Italian zombie films, says its creator, but the result seems just as evocative of PS1-era horror, from the fixed camera and tank controls to the '90s 3D art. Check out the trailer below. There are no floppy-haired cops or panicking parents here, just a tiny orphan who can handle a rifle. She's trapped in an orphanage, along with some hungry monsters and presumably guns and ammunition (like all orphanages). In lieu of a synopsis, developer Puppet Combo has opted for an ominous message. The Glass Staircase is out now on Itch.io for $5 or more.